Henry Lee McFee was a celebrated early modernist. Born in St. Louis, Missouri in 1886, he attended the Kemper Military Academy before pursuing studies in art. He attended the School of Fine Arts in St. Louis and spent a year at the Stevenson Art School in Pittsburgh. Next, McFee traveled east with the intention to study in New York City, but became entrenched in Woodstock, NY, a place that greatly shaped his artistic output over the years. He attended classes held through the Art Students League, and was instructed by tonalist painter Birge Harrison. McFee received a prize for his efforts in landscape, and a reproduction of one of his works was included in a 1910 article about the school. McFee was deeply affected by the works and esthetic theories of Cézanne and the post-impressionists. This influenced his use of color, and the tactile and expressive qualities of his works. He also studied the writings of Roger Fry and Clive Bell, as well as the works of Giotto and the Florentine Renaissance painters. His friend Andrew Dasburg, meanwhile, introduced him to numerous Parisian modern artists. 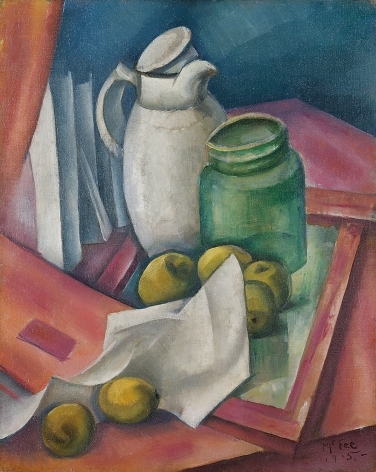 McFee found an interest in cubism as practiced by Picasso and Braque, and was subsequently inspired to explore qualities of rhythm in his compositions. 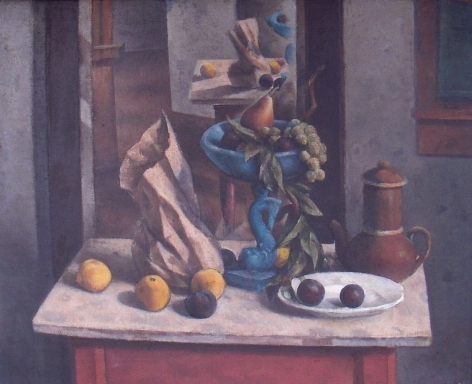 Much of his work focused on still lifes and working with commonplace objects. McFee earned admiration for his carefully created scenes, and the plasticity he fostered by using color to develop shape and form. McFee exhibited with post-impressionists at the McDowell Club, New York, in 1912, and at the “Forum Exhibition of Modern American Painters,” organized by the Anderson Galleries in 1916. Frank K. M. Rehn, who opened a New York gallery during the 1920s, represented his work alongside that of Edward Hopper and Charles Burchfield. Institutions that exhibited and awarded his work included the Carnegie Institute, the Art Institute of Chicago, the Corcoran Gallery of Art, the Pennsylvania Academy of Fine Arts, the Paris Salon, and the Virginia Museum of Fine Arts. McFee taught at Scripps College in Claremont, California, and died in 1953 in Pomona. He was a member of the New Society of Artists, the National Institute of Arts and Letters, the American Society of Painters, Sculptors, and Gravers, and the Woodstock Art Association.